When most Americans think of psychedelic rock, they think of San Francisco in the late 60s. But it was actually a diverse global movement, with active scenes in Japan, Latin America and even Turkey (check out Normal Records’ Love, Peace & Poetry compilations for more). 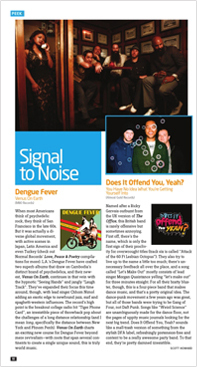 L.A.’s Dengue Fever have crafted two superb albums that draw on Cambodia’s distinct brand of psychedelica, and their newest, Venus On Earth, continues in that vein with the hypnotic “Seeing Hands” and jangly “Laugh Track”. They’ve expanded their focus this time around, though, with lead singer Chhom Nimol adding an exotic edge to newfound jazz, surf and spaghetti-western influences. The record’s high point is the breakout college radio hit “Tiger Phone Card”, an irresistible piece of throwback pop about the challenges of a long distance relationship (and I mean long, specifically the distance between New York and Phnom Penh). Venus On Earth charts an exciting new course for Dengue Fever beyond mere revivalism—with roots that span several continents to create a single unique sound, this is truly world music. Named after a Ricky Gervais outburst from the UK version of The Office, this British band is rarely offensive but sometimes annoying. First off, there’s the name, which is only the first sign of their proclivity for overwrought titles (track six is called “Attack of the 60 Ft Lesbian Octopus”). They also try to live up to the name a little too much; there’s unnecessary feedback all over the place, and a song called “Let’s Make Out” mostly consists of lead singer Morgan Quaintance yelling “let’s make out” for three minutes straight. For all their bratty bluster, though, this is a four-piece band that makes dance music, and that’s a pretty original idea. The dance-punk movement a few years ago was great, but all of those bands were trying to be Gang of Four, not Daft Punk. Songs like “With A Heavy Heart” and “Weird Science” are unambiguously made for the dance floor, not the pages of uppity music journals looking for the next big trend. Does It Offend You, Yeah? sounds like a mall-trash version of something from the stylish DFA label, refreshingly pretension-free and content to be a really awesome party band. To that end, they’re pretty damned irresistible.